Please Note: in the above pictures: in the right side picture, left is .457 WWG vs. Right .45-70 for size comparison. Limit to 3 cartridges per collector. 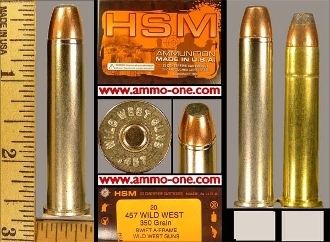 One Cartridge, not a box: .457 WWG (WWG = Wild West Guns) by Wild West Guns of Anchorage, Alaska, "older" production by HSM for Wild West Guns using new, nickel plated brass cases with “WILD WEST GUNS .457" Head- Stamp and loaded with a 350 grain Swift A-Frame, JSP (Jacketed Soft Point) Projectile. Wild West Guns® was founded by Jim West of Anchorage, Alaska in 1992. They are known not only for being onthe Discovery Channel with their own TV show (Wild West Alaska), but also for being one of the best gun smithing stores in the USA, if not the world. They first obtained recognition for their Race Guns, and subsequently developed the now world-famous CoPilot, a lever-action, take-down rifle chambered in their own proprietary cartridge - the .457 WWG Magnum (an extended length .45-70 case) along with the .45-70 caliber cartridge.